I love mid-century Kodachrome film – the colours are so vibrant that the images often seem to have a slight filter of fantasy applied to them. This view of George Street is one of my favourite examples. It was captured in 1957 by Ray Hargreaves and is copied from a collection of 35mm slides he donated to the Hocken Collections last year. I was going to use it as an illustration for a building story but it really deserves a post of its own. Photographs of George Street in the 1950s are hard to find and usually black and white, so when a rare colour one turns up the different way of looking at the scene can be startling. This image shows familiar facades, including what are now the Golden Centre and Meridian Mall sites on the right. The spot is today one of the busiest in Dunedin, but it bustled even before the northward drift of the shopping area. Further along are buildings demolished in the late 1960s to make way for a Woolworths (later DEKA) store, which was in turn replaced by the Wall Street complex (opened 2009). The facades have the warm yellow-cream finish that was once common, with typical green trim to go with it. The old finish is quite different from the gloss paint on these facades today, although they don’t yet have those battleship-grey colour schemes that have become the fashion over the past decade or so. The Municipal Chambers tower is now obscured by the Civic Administration Building, but here it adds a delightful contrast to the streetscape, and you can also use it tell the time: about 9.40 a.m. The tree plantings and wider bricked pavements of today are noticeably absent, but flower boxes enliven the verandah and first-floor frontage of the Arthur Barnett store. It’s quiet and there are plenty of empty parking spaces (is it a weekend?) and the one-armed bandit parking meters stand out. They were among the first in Dunedin, installed between 1955 and 1956, the first in New Zealand having been installed in Auckland in 1953. The cars have the Venetian red number plates of the time, and on the right are two matching Vauxhalls in front of a Standard Vanguard. There are a few pedestrian shoppers, with hats, gloves, bag trousers, a bow tie, and a cigarette all in evidence. The Arthur Barnett building was erected in 1925 and designed by one of Dunedin’s best-known architects, Edmund Anscombe. Additions were made from 1952 and the store reopened in 1954 with the original facade extended from five to eight bays. This image predates a major fire in 1959 that led to further rebuilding, and when the Meridian Mall was constructed between 1995 and 1997 a further two bays were added to the facade. These expertly matched the original in design and materials, but perhaps lengthened it a bit beyond good proportion. The much-loved neon horse and clock are out of view here. Further to the south are the old Southampton Buildings, now part of the Golden Centre. This block was designed and built in 1877 by its original owner, the iron founder William Wilson. It was renamed Stafford House in the twentieth century but the original name can still be see in decorative ironwork below the central window on the first floor. The image shows a bay window that was not part of the original design and which was later removed. A prominent sign advertises Islip & Watt. Harry Islip opened his boot and shoe shop in George Street in August 1898, and in 1909 went into partnership with H.L. Watt to form Islip & Watt. The business continued till 1962. 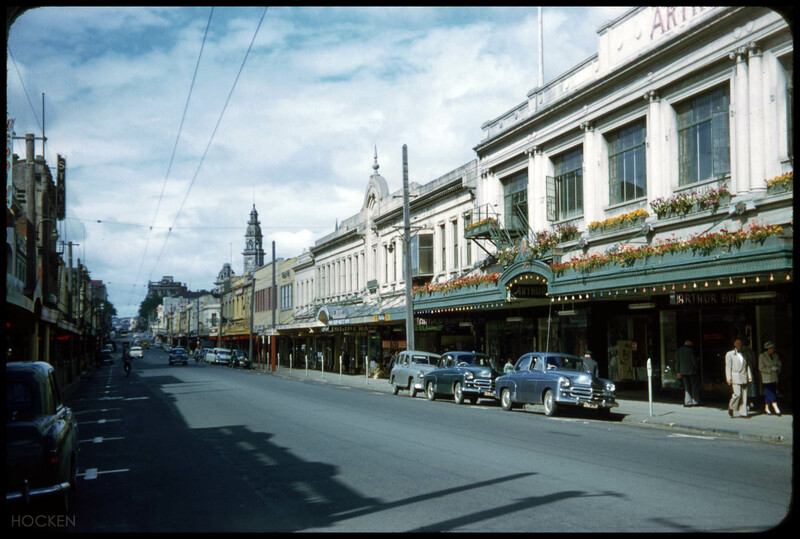 If anyone has other 1950s-1970s slides showing Dunedin buildings and street scenes I’d be very interested to hear about them. I hope to share more here from time to time, including some I have scanned from originals by Hardwicke Knight (see also the Upright! 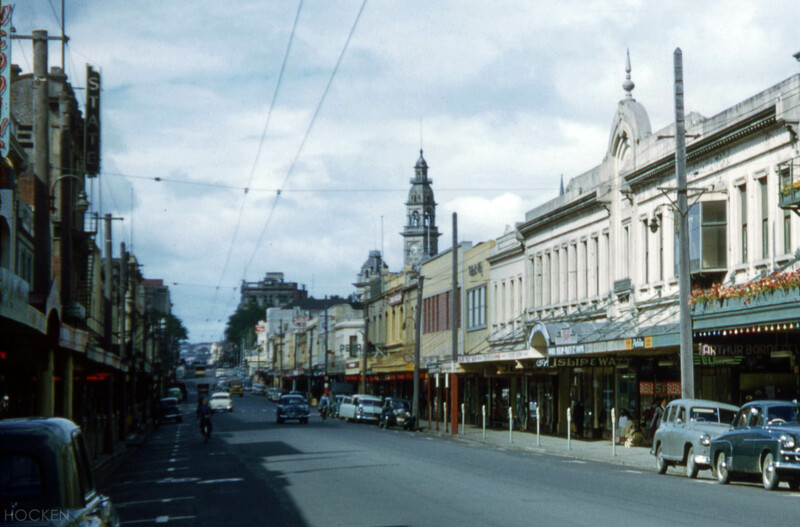 Exploring Dunedin’s Built Heritage facebook page). Scanning technology can now get very good results from small transparencies, and if more of these images can be preserved they will be a valuable resource for the future. 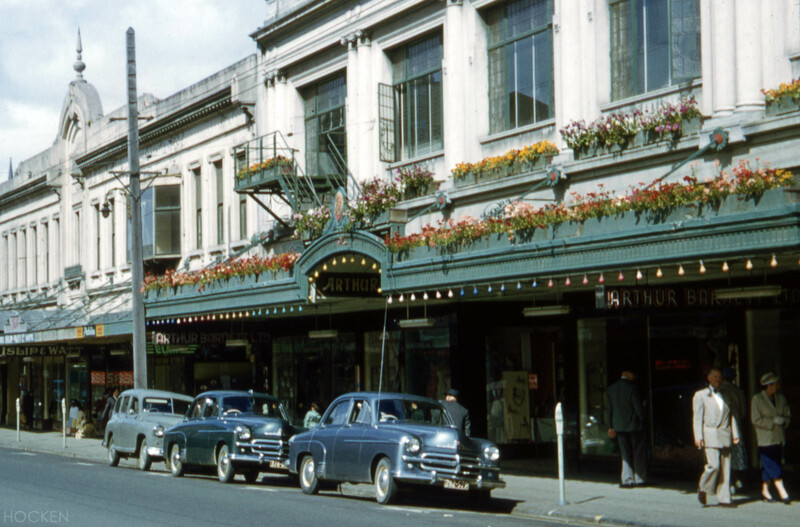 Experiencing Dunedin in Kodachrome is quite delightful! Thanks to Ray Hargreaves and the Hocken Collections for the image scanned from a 35mm Kodachrome transparency (ref: S13-127a), and to Peter Entwisle for details relating to the Southampton and Arthur Barnett buildings. This entry was posted in Uncategorized and tagged 1950s, Arthur Barnett, Colour photography, DEKA, George Street, Golden Centre, Hocken Collections, Islip & Watt, Kodachrome, Meridian Mall, Ray Hargreaves, Southampton Buildings, Stafford House, Woolworths on 31 December 2014 by David Murray. Thoroughly enjoyable to see George Street here, several years before I was around to see it in person! By any chance do you have any images which show Howarth Fabrics, on the other side of the street from this image? McDonalds now stands in the space. My grandfather was the owner, Pat (Ernest) Howarth. Thanks Andrea. I know of an image from 1948 showing Drages Home Centre in the building but unfortunately don’t know of any showing Howarth Fabrics. I’ll keep and eye out. Thank you David, I’m glad you’re enjoying it! Best wishes to you and your family for 2015. What an incredible photograph – George St was a lovely main street. Have just come across your blog – which is amazing! Best resource I’ve come across that chronicles such a significant part of Dunedin’s history. Thank you! Look forward to reading more with much pleasure. Regards, Esther. That’s so lovely to hear – thanks Esther. Evokes great memories of medical school and the flats we lived in during the 1950s.